A few weeks back we made a change so that it's mandatory to have at least one attached file or HTML version available on a publication page. We did this because it's important that we provide a consistent user experience for publications. The publication format on GOV.UK is conceived as the end point for accessing a stand-alone, self-contained document - something which is reached via the website as opposed to being part of the website. The document itself is a date-stamped, issued information product - something portable, packaged, intended for distribution. Usually there is some ceremony about its release. Often there are bibliographic reference numbers. 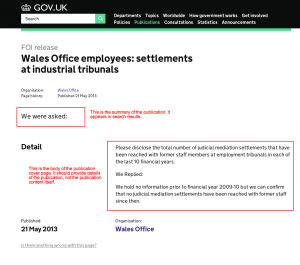 The function of a publication cover page on GOV.UK is to provide meta-information about the document. It is the permanent, canonical URI for accessing and referring to the document (as opposed to the attachments themselves, which might be numerous, may get replaced, can accumulate in number over time, or offer multiple file formats representing the same document). There are clear and obvious examples which fit this concept neatly: things like white papers, strategies and plans, research reports, reports from inquiries and reviews. At the other end of the spectrum, there are things which are less obvious fits for the format, like maps, forms, circulars and newsletters, posters and similar marketing material, and correspondence with ministers and officials (like decision letters). These still fit the definition, albeit less clearly. In the middle of that scale sit things like transparency data and responses to FOI questions. These have more in common with publications than, say, any of the announcement formats in that they are things which are released, issued, made available - more often than not in a document format. In other words, you should never (and now cannot) put the content of the publication itself into the "Detail" ("body") part of the publication cover page. The body of a publication page is used to provide a summary of the publication in plain, neutral language – to reassure the user that it is (or isn’t) what they’re looking for. Include what the publication is about and its purpose. Publications often outlive governments so keep the language politically neutral. Include links to related publications but use series to group them if more than a few. ‘These reports describe the effect of government proposals to reduce the amount of money spent on legal aid. The aim of the reforms is to make sure legal aid is still available for support and representation in cases where it is justified." 1. 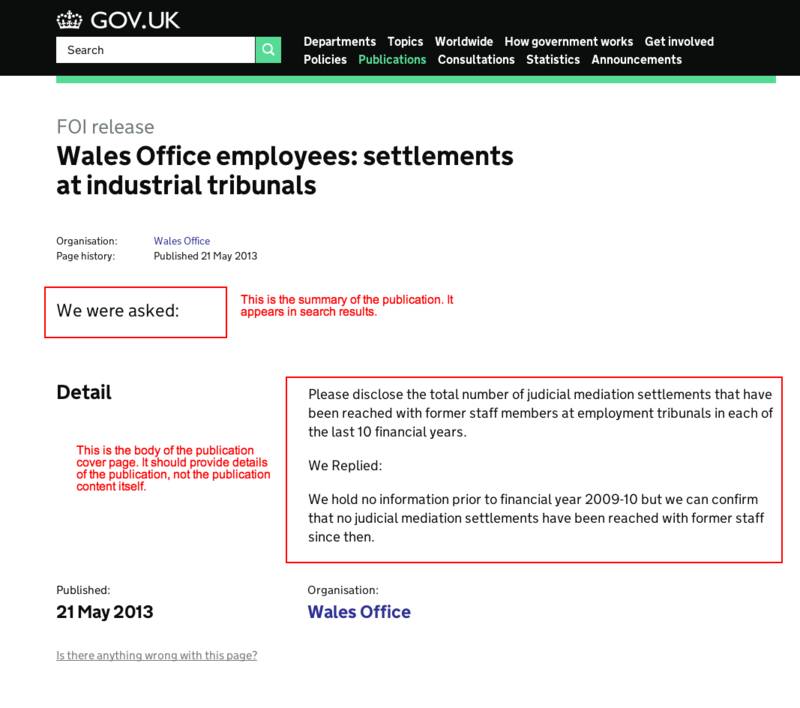 I acknowledge that, in the case of very short FOI questions and answers like the screenshot above, it feels a bit like overkill to have to click through to a separate HTML document to view the content. We'll be looking at FOI as a special case for future iteration. Until then, putting the actual content into the HTML version is the right thing to do and a more appropriate use of the format than crowbarring it into the wrong fields. 2. We will need to migrate the legacy publications that have content in the wrong fields into HTML versions. 3. The inconsistent labelling of the field in admin ("body") and the heading on the frontend ("Details") is confusing both on publications and consultations. We'l sort that out when we can. Those are the problems we know about. There may be other problems we don't know about, so please don't hesitate to point them out. With regards to your point about macro-enabled spreadsheets, calculators and tools, we were advised by our transition manager that they were to be transitioned as guidance publications. We felt uncomfortable out this, so we’re glad that you agree that this is not the best template for them. However, we are a bit confused about your suggestion to attach them to policy detail pages. We didn’t think attachments were allowed on detail pages. Additionally, not all calculators will be high-level enough to be mentioned in policy content. What do we do then? Wouldn’t it make more sense to create a new publication type (maybe called ‘tool’ or ‘data’) for this sort of thing? We’d be happy to be the guinea pig if you need some content to test this on. I don't think "tool" works as a publication sub-type. I'm fairly confident that the most logical place for this kind of thing is on a supporting detail page - and these do support attachments, for that very purpose. If it's too niche to go there, then perhaps you should be sharing the file with the users directly not publishing it on GOV.UK. Let's continue this conversation via your transition manager though, and look at the specific examples you are thinking of. Thanks for volunteering to help explore it a bit with us. I received advice from GDS yesterday that where a document is hosted on another website, we should set up an "empty" publications page (with no attachments) and link to the other website. We would need to do this for business plans, which are now hosted on the No 10 transparency website, but people would expect to find on GOV.UK. This would be similar to the facility you set up to link to consultations hosted on other websites. Do you still have plans to allow for publications pages with no attachments in these circumstances? if so, do you know when we will be able to do this? Yes, we're working on that feature right now. See https://www.pivotaltracker.com/story/show/57075656 if you're interested in the details.